In North America the Appalachian (or mountain) dulcimer is very well known. In the rest of the world, a short introduction may be in order. This is what they look like; one I made in 1981. The instrument appeared in the eastern USA in the mid 19th century. Used for dancing and vocal accompianment, the dulcimer nearly died out in the 20th century. Present interest stems from a revival of folk music and folk instruments, the dulcimer revival beginning in the 1960's in the USA, lead by Jean Ritchie and Richard Farina. In popular music, perhaps the best known use of the Appalachian dulcimer is by Joni Mitchell on her 1971 album Blue. The dulcimer is is usually played with the instrument resting on the players lap. The simplest instruments have three strings - one a melody string, the two others drones. 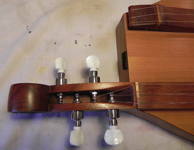 One hand strums all the strings while the other slides a noter (wooden rod) over the melody string. In the traditional manner of playing drone strings are never fretted. Modern players use a variety of styles including finger picking. They will fret the drone strings and have explored many musical avenues on the instrument. Here is a typical guitar fingerboard. Notice how the frets are placed. Playing these frets in order will result in a chromatic scale, every note will be played. A glance at the fingerboard of the dulcimer at the top of the page shows that it is different, with frets apparently missing. If you start playing at the third fret, the scale we recognise as do re mi fa so la ti do will be played. The intermediate notes are not available. This is known as the diatonic scale. Not many stringed instruments have diatonic fretboards. The other unique feature of the dulcimer is the drone strings. There are usually one or two melody strings (tuned in unison if two) and the other strings are drones, meaning their pitch does not change while the instrument is being played. Early dulcimers have frets made of nails which were hammered in and bent over under the melody string and did not extend under the drone strings. In the British Isles there is no traditional stringed instrument which has these features, but the bagpipes have a similar arrangement with a chanter and drones. One has to look to mainland Europe to find diatonically fretted stringed instruments with drone strings. A Citera, owned by Stuart Walsh. The Appalachian dulcimer appeared in the early to mid 19th century in the southern Appalachian mountains. These mountains formed a barrier between the easily settled coastal plain and the inland. Many people moved through the mountain passes moving westward and some remained to farm the beautiful but infertile land. These people became hill farmers and were not generally well off and subsistence farming was usual. 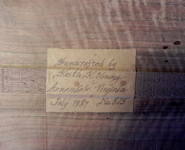 It was here that the first Appalachian dulcimers appeared. The earliest dulcimers must have come from settlers who remembered the instruments from the home country. although a great deal of the music of Appalachia has its roots in the British Isles, the dulcimer must have come from elsewhere. Very possibly it was German, as settlers from there were well represented in the region. Early records are scant but research shows three strains of making in the area. By the early 20th century, there are many photos showing family gatherings with a dulcimer present, later along with guitar and banjo. A good history is Appalachian Dulcimer Traditions by Ralph Lee Smith. A rather rare and unusual variant of the Appalachian dulcimer is the courting dulcimer. 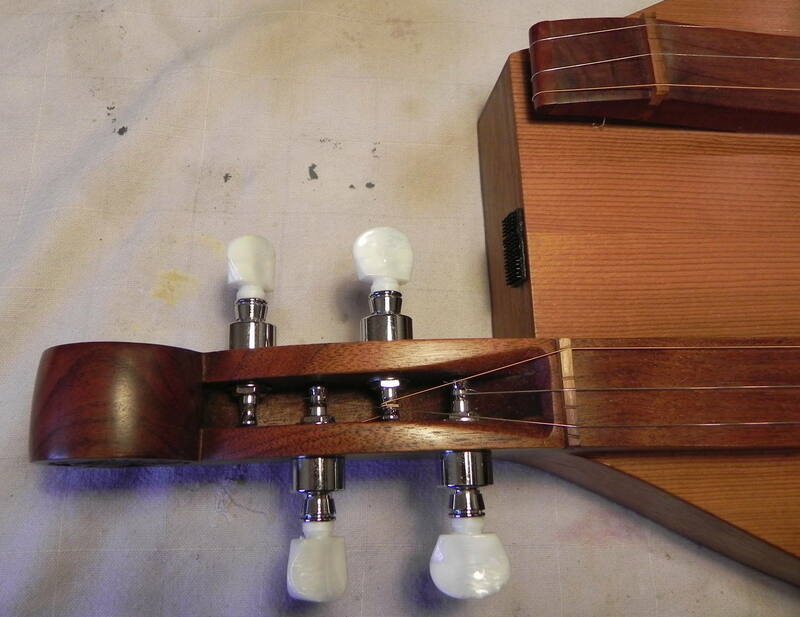 It consists of two dulcimer fretboards mounted on a single body. If played by a courting couple, no chaperone would be needed as long as the music could be heard. The instrument belongs to John Shaw. Click on the photos for larger versions. 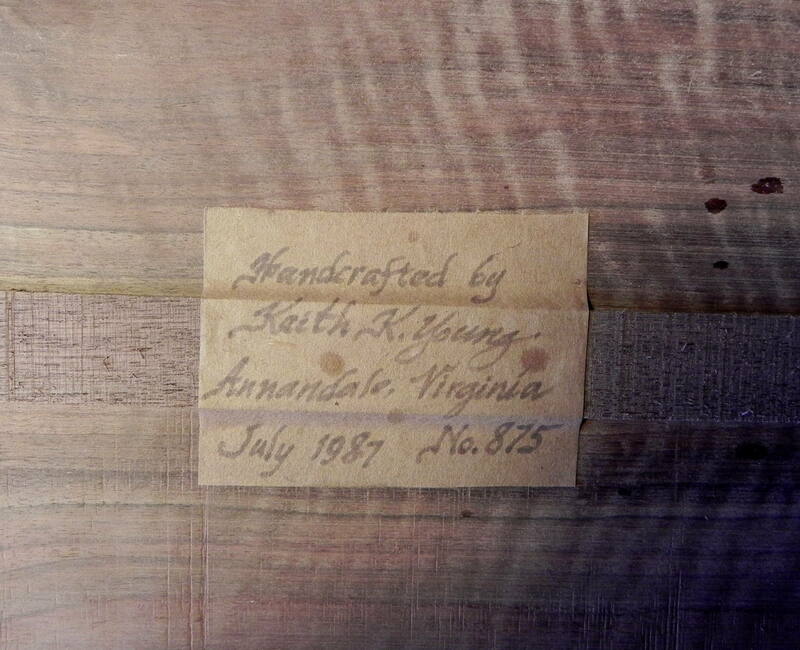 The maker is Keith K. Young and the instrument was in the workshop to cure a buzz and to make two bone bridges and two bone saddles. The buzz was due to the one transverse bar on the back coming loose. removing the back gave me an opportunity to see how Mr. Young braced the inside of the dulcimer. A dulcimer by Dwain Wilder of Rochester, New York of Bear Meadow Appalchian Dulcimers. This dulcimer is chromatically fretted and features planetary geared pegs and a Fishman under-saddle pickup. Dwain has inherited the Sunhearth Appalachian dulcimer design. The Sunhearth and Timber Hill dulcimers belong to my friend, John Shaw, who happens to have four dulcimers made by myself. John occasionally plays in the traditional manner but far more often uses a sophisticated mix of flatpicking and strumming with a pick to achieve wonderful sonorities. In the UK the Nonsuch Dulcimer Club caters for both Appalachian and hammered dulcimers. Friends of the Mountain Dulcimer FOTMD, a friendly website, worldwide, almost a social networking page for dulcimer people. Lastly, just to entice you, I make Appalachian dulcimers from beautiful English timbers.